Monica was born in Tagaste, North Africa, in the year 331. As a young girl, Monica had a reputation for being strong-willed. This determination carried over into her adult life. As was customary, Monica married a man that her family had chosen for her. Together they had three children. But Monica’s was not a happy marriage. Her husband, Patricius, was an unkind man. He had a violent temper and also had a habit of wasting all of their money. Despite his faults, Monica loved her husband. She dreamed of a better life for herself and her children. 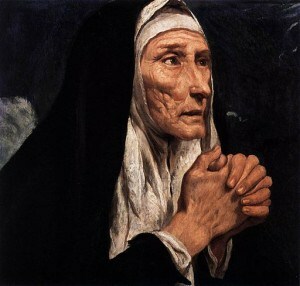 Monica had always been very religious and turned to God in her time of need. 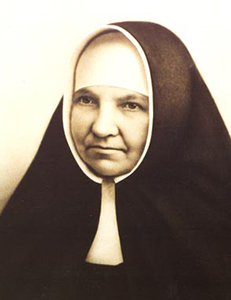 She was determined that her husband and children should become Christians. At first, Monica’s husband was completely against the idea. He believed he had no need to know God. But soon, Monica’s devotion to her faith moved her husband, and he agreed to be baptized. 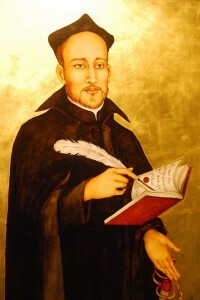 Monica’s son Augustine was enrolled as a catechumen as young child. It was the custom in those days to delay Baptism for infants and children; they were baptized later in life. As a young man Augustine was not interested in God or religion, in fact he led a rather corrupt life. Monica prayed for him every day—for more than 17 years! Finally he changed his life and agreed to be baptized. Later, he would become one of the foremost religious people of his time. His writings are still studied today. Augustine was made a saint in his own right. Monica died in 387, and had it not been for her dedication and devotion, the world may not have ever known St. Augustine. It is for this reason that she is considered an excellent example of a strong Christian woman. She is the patron saint of married women.